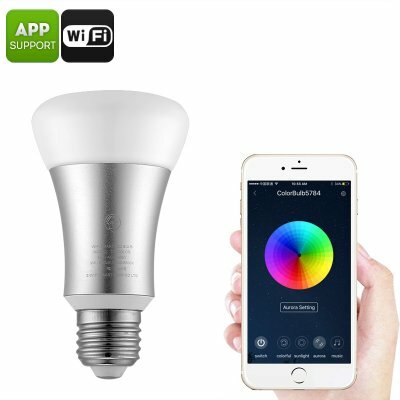 Successfully Added Smart WiFi LED Bulb - 16 Million Colors, 600 Lumens, WiFi, App Support, 30,000 Hours, E27 Base to your Shopping Cart. This RGB Smart WiFi light bulb lets you turn any lamp inside your home or office into a colorful LED color light. This cool electronic gadget is capable of displaying over 16 million colors. Therefore, it truly will set the right atmosphere for any occasion. Naturally, it can also be used as a regular LED light by emitting a warm white light which is perfect for lighting up your living room or bedroom. By emitting up to 600 lumens, this powerful WiFi LED light is perfect for any home or office. With its E27 socket, this RGB LED light brings along great usability. You will be able to simply screw it into your regular lamp sockets and turn any of your lights into a smart WiFi controlled color lamp. By emitting plenty of light, this WiFi LED is capable of covering any room in your favorite color. The bulb itself features a stunning 30,000 hours of service life. This means that you’ll be able to use it through plenty of years to come without needing to worry about any replacements. Thanks to its smart design, your WiFi LED can be controlled through the dedicated Application on your iOS or Android smartphone. This brings along great efficiency as you’ll be able to adjust the color of your light and simply switch it on or off with the touch of a button on your phone. Therefore, you’ll never have to get up from your chair again in order to apply a different color coating to your room. This smart LED light is great to be used for at home and in the office. Additionally, it could be used for commercial purposes or for studio and exhibition lighting. This smart LED comes with a 12 months warranty, brought to you by the leader in electronic devices as well as wholesale electronic gadgets..